An Award Winning Timeless and Inspirational Love Story about Life. Rediscovered private letters from a dying father to his children--and his wife--uncover a passionate and powerful guidebook to life. The letters reveal to us the stories, memories, and music of the father, which ultimately becomes the practical, moral, and spiritual gift and guidebook for his children he'd never live to see, and for his wife, his redemptive story of love. By combining the best elements of such inspirational books as Tuesdays with Morrie, The Last Lecture, and Chicken Soup for the Soul, author Carew Papritz, has created an intense and thought-provoking book, filled with life instructions that The Huffington Post calls: "A Must-Read Book of Wisdom for Life... exquisite, intimate, passionate, humorous and genuine..."
Who Reads This "Everybody Book?" Romantic and pragmatic, old-fashioned and new-fashioned, life- questioning and life-altering, The Legacy Letters is an "everybody book." It appeals to new parents and parents-to-be for its detailed life instructions. Parents are reading it to and with their children. Teenagers are rediscovering timeless values and ideas still relevant for a new time. Grandparents read it for the nostalgia of an earlier time and to read to their grandchildren. 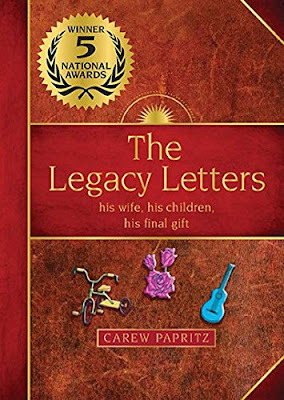 The Legacy Letters Makes Publishing History-- The Legacy Letters and its author, Carew Papritz, recently achieved publishing history by becoming the first book ever to win awards as both a nonfiction book and a fiction book! Because of its universal appeal, The Legacy Letters is a wonderful book for almost anyone in your life,--a true "everybody" gift book that is universal gift for all. Needing gift ideas for birthdays? Trying to track down that perfect holiday gift? Look no further. The Legacy Letters has something for everyone. Perfect Gift for Mom--As the winner of the Mom's Choice award, The Legacy Letters makes a perfect gift for mom on her birthday or even as a Mothers Day gift. It truly is a love story about life. Great Gift for Dad-- For that someone who probably has everything--it's a great gift for dad--as a Fathers Day gift, for his birthday, or anytime. He'll love the down to earth cowboy wisdom mixed with inspirational words of what it means to leave behind a legacy for his own children. Perfect Book for Expecting Parents--The Legacy Letters was written as life guide from a father to children, which makes it an inspiring gift for expecting parents or as the perfect gift for new parents and their newborn! Graduation Gift Book--The Legacy Letters is great for someone who's starting out in life and needs a little advice to help them on their way! Whether graduating from high school or college, have your graduate read the letter, "When You're Eighteen, Don't Read This!" A Memorable Gift for Grandparents. Grandparents who enjoy a stroll down memory lane and also want to share an old-fashioned, back to basics book with their grandchildren will find The Legacy Lettersa gift that gives both ways. Gift ideas for Christmas? The Legacy Letters makes a wonderful holiday gift and stocking stuffer. It's a small and beautiful book that's filled with words of wisdom and inspiring quotes about life, love, and everything inbetween. Book Lover Ideas? Running out of books to give your favorite book lover? Just read what the Top 50 Amazon Reviewer, Grady Harp, wrote about The Legacy Letters: "Books of this nature and this quality are rare, Keep it in your library and share it with everyone you love." If your search for life's meaning encompasses inspirational books or spiritual books, motivational books, or self-help books, then look no further. The Legacy Letters has life lessons to live by for every age and generation, a timeless book that reviewers have called, "A nightstand essential." This is a excellent book ~ it will bring tears to your eye in joy and sorrow. A perfect holiday gift for the book reader on your list.